Nearly all the respondents first tried cocaine when it was offered by a trusted friend. Many of the sample reported that they did not get high the first time they snorted cocaine. They had to learn both to experience and then to appreciate the subtle euphoric effects of the drug. The majority of respondents increased their use gradually – there was no uniform progression or pattern. The slow escalation was likely due in part to a general increase in the availability of cocaine in Northern California at the time. Two other factors were often cited as contributing to escalating use: a slow increase in tolerance for the drug, and the seductive and insidious nature of the drug itself. The tolerance reported with cocaine appeared to be somewhat different to that observed with opiates. Whilst some users reported increasing their doses of drug, they did not generally report decreased effects of the same dose. Rather than needing more of the drug to get the same effect, they reported wanting the same effect again and again. The researchers described four relatively discrete patterns of use. Hogs showed a consistent, very heavy daily use. This pattern of use caused more dramatic effects, greater compulsion, as well as marked painful “comedowns” and depression. Nippers used regularly, often every day, but only in relatively small amounts. These users kept their drug use subordinated to work and family responsibilities, and often avoided the negative effects associated with heavy use. Bingers used cocaine heavily and then lay off the drug for days or weeks. Use was often constrained by personal finances or by prolonged negative effects. Some bingers found their binges getting longer and longer. Ceremonial or occasional users used the drug on special social occasions. The researchers reported a considerable movement by individuals from one form of use to another. Although some users followed a downward spiral from experimental use to addiction, as many others nipped and then binged and then nipped again. Others moved from heavy binge use or sustained abuse to ceremonial use. Long-term daily use of cocaine or regular heavy binges often led to problems. The most frequently mentioned were nasal irritations, paranoia, insomnia, strained relationships with their wife or husband, depleted savings, hangover days at work, and periodic sexual difficulties. Some of these problems were reported as serious, but many were not. [The most serious cocaine-related health problem reported was seizures and convulsions.] Most of the respondents appeared to find most of the problems manageable most of the time. They seemed to get pleasure from cocaine, and accepted the problems as part of the territory. Most of the sample agreed that moderate use of cocaine can be an exceedingly enjoyable experience – it produced euphoria, more energy, a certain intellectual focus, enhanced sensations, an increased sociability and social intimacy. 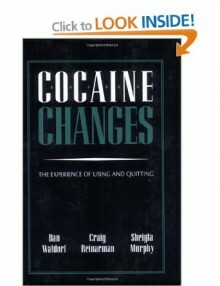 However, daily use or regular binges transformed the experience of the cocaine high. The initial euphoria slowly and subtly became dysphoria, whilst feelings of well-being turned into feelings of being unwell and unhappy. Feeling energetic was replaced with feeling apathetic. For some heavy users, the world that had once been good to live in became a place that was far less hospitable – paranoia increased and depression sometimes developed. These changes in psychological experience were accompanied by transformations in social experience. The person used the drug in isolation, rather than in social groups as was done initially. The shift in balance to the negative effects of cocaine often resulted in considerable psychological pain, and a questioning of the rationality and desirability of continuing to use the drug. At this time, those people with conventional stakes in families, homes, jobs, communities and identities tended to find the resources and resolve to abstain or reduce their drug use. Waldorf and colleagues interviewed 106 people who gave up using cocaine (quitters) in their study. Thirty of these had received some form of treatment, whilst 76 stopped using cocaine without treatment. When respondents were given a list of personal reasons for quitting, the most common (47% of sample) was given as health problems. The next most cited reasons were financial problems (41%), work problems (36%) and pressure from spouse and/or lover (36%). Only 7% cited actual arrest, although 28% cited fear of arrest as a reason for quitting. Respondents were also given an open-ended summary question on the most important reason or reasons to quit. A total of 61% mentioned some form of psychological problem or stressful state caused by cocaine as the most important reason to quit. The next most common reasons were financial problems (23%), and severe or recurrent health problems or concerns (19%). There was great diversity in actions that respondents took to quit using cocaine. Some made a number of attempts to stop before they actually succeeded. They despaired over the hold the drug had over them and had great difficulty in maintaining a resolve to stop using. However, over a half of the sample stopped using on their first try, although this was not always easy. Two-thirds of the untreated cases stopped on their first attempt, whilst only 20% of treated cases did so. The most frequently used strategies for stopping to use cocaine were social avoidance strategies. More than 40% of all quitters reported making some sort of geographic move as part of their successful attempt to quit. Two-thirds of these people said they moved to another city or state, at least in part to help them stay away from cocaine. Nearly two-thirds of the quitters said they had stopped going to places where cocaine was being used, or had made conscious efforts to avoid seeing cocaine-using friends. Over 40% had also sought out new friends who did not use cocaine. More than 75% of the sample became more concerned about their physical health whilst quitting and acted upon these concerns. Two-thirds improved their eating habits, and a half undertook new programmes of physical conditioning. Over half of the quitters sought out new interests, with 39% participating in sports to help them avoid using cocaine. Similarly, 55% of the sample used informal help, such as family or friends, to stop using cocaine. Only 17% of the sample started using other drugs after quitting cocaine. Of those that did, the majority used only marijuana, which almost all had used before and during their cocaine use. Whilst 21% drank more alcohol, most drank less after giving up cocaine. The sample were different to heroin addicts in other studies, many of whom came from disadvantaged backgrounds, had been criminalised and stigmatised, and had few private resources (e.g. education, jobs). For many of the present sample, prolonged use of cocaine stopped being fun and starting disrupting rather than enhancing everyday lives. Since these lives had meaning and value, the difficulties caused by cocaine became powerful spurs for cessation. The researchers were “pleasantly surprised” by the relative ease with which so many cocaine users managed to quit. Their strategies were in general fairly commonsensical social avoidance strategies designed simply to put distance between themselves and the drug. Most of the quitters were able to manage the cravings they experienced after stopping cocaine use. They realised that cravings were only transitory – distractions caused them to subside. New interests and activities provided such distractions. These findings emphasise the importance of one’s personal and social identity in influencing drug use. A commitment to a conventional identity and everyday life helps form the social-psychological and social-organisational context within which control and cessation of drug use is possible. It is commonly stated that drugs come to dominate identities and lives. This was true in the most problematic cases in the Waldorf study. However, for the bulk of the sample, identities and lives usually dominated drug use. This is a critical fact that must be remembered when we try to help people overcome problems caused by drugs and alcohol. “Controlled users tended to be people who did not use cocaine to help them manage pre-existing psychological problems, and did not also abuse other drugs, especially alcohol. Controlled users generally had a multiplicity of meaningful roles which gave them a positive identity and a stake in conventional life (e.g., secure employment, homes, families). Both of these anchored them against drifting toward a drug-centered life. This research suggests that a stake in conventional life and identity are central for understanding continued controlled use. Such stakes seem to keep a person’s drug use from overtaking their life and identity. They also facilitate an individual reasserting control after a period of problematic use. The fact that these social and social psychological factors mitigate against cocaine misuse and related problems suggests that not everyone need develop a problem with cocaine, even when using heavily as this population was. At the same time, it follows that those people with the least stake in conventional life may be at the highest risk for problematic cocaine use. Cocaine, and in particular crack, have had a marked impact in poor neighbourhoods, causing problems to many individuals and communities. Obviously, these forms of social control are not foolproof for maintaining controlled use. Some people with a large investment in conventional life did lose control of their cocaine use and develop serious problems. Waldorf and colleagues recognised that some well-intentioned parents and policy makers might not want to broadcast findings about controlled use for fear of facilitating the denial of some misusers or increasing the risks for some new users. The researchers made the very good point that if the only frameworks in society for interpreting one’s drug-using behaviour are addiction and abstinence, then the idea that one can and should exercise control can atrophy. Whilst cocaine is often portrayed as a powerful reinforcing psychoactive drug, we sadly do not often hear that its powers are also mediated by users’ norms, values, practices, and circumstances. We underestimate the powers of social, social psychological and cultural aspects, whilst overestimating the pharmacological power of the drug. Crack is derived from the processing of cocaine hydrochloride to extract a purer, more solid form of cocaine (freebase), which provides a powerful high when smoked. Crack initially appeared in impoverished minority neighbourhoods in the USA and was claimed to be “instantly addicting” and associated with high levels of crime. Fifty-three of the sample interviewed by Waldorf and colleagues had been freebasers or crack users for a substantial portion of the peak period of their cocaine careers. Most had snorted cocaine for years before using crack and some went back to snorting after stopping using crack. This meant that the change in mode of ingestion was a small step down a well-worn path, rather than a large one down a road never taken before. Most of the sample believed that the idea that crack was “instantly addicting” is overly simple. Many experimented with the drug for months before getting in to a pattern that might be described as compulsive, whilst others freebased or smoked crack on a periodic basis without the drug taking over their lives. The potential consequences for young socially and financially impoverished members of an “underclass” – who contrast with this population – are clear to see. Why does crack or freebase cocaine exert such a powerful effect? The respondents’ described a roller coaster ride, in which three interacting elements help explain the power of the pipe. First, the smoker is rapidly brought up to an intense euphoric high (“orgasmic rush”). Second, this euphoria begins to ebb almost immediately. Third, one proceeds downwards almost as quickly as going “up”, down to a level that is much lower than one was at before smoking. This low feeling appears even lower given how high one has been. It is only by rapidly repeating the high that one is able to avoid the painful low. Binging maximises the highs whilst warding off the painful lows, although it is inevitable that the person will eventually plunge into a low state. The roller-coaster rides described above led most of the freebasers and crack users to ingest in a pattern that was described as obsessive or compulsive. When they had a supply of freebase or crack, most users could not stop smoking until all drug had gone, even when sessions might last days and/or large amounts of money were spent. The compulsive quality was taken for granted; obsession was an intrinsic feature of freebasing and crack use. All of the ill-effects experienced by many of the heavy cocaine snorters – problems with physical and mental health, family and friend relationships, finances and functioning in daily life – were amplified and accelerated for freebasers and crack users. Whilst drug-taking sessions tended to be social in the early stages of freebase and crack users’ careers, these social activities fell by the wayside. The person began to forget about everyone else, becoming totally focused on the pipe. The pleasure of the high and the intense desire to repeat it were so strong that a narcissistic greed took over from the ethic of sharing within social groups that often occurs with other drugs, including cocaine powder. When under the influence, many crack and freebase users cannot believe their supply has finished and they cannot have another hit. They might crawl around on the floor desperately looking for nonexistent crumbs, or accuse spouses/friends of taking more than their share. Isolation is preferable because the person does not have to share or deal with anyone else. When smoking the pipe, freebasers and crack users often acted in ways that would be totally unacceptable to them when in a drug-free state. They often lied to, neglected and even stole from spouses and friends. They sometimes neglected their children. Waldorf and colleagues pointed out that perhaps the clearest indicator of the obsessive form of this form of drug use is the extent to which people continued to use in the face of overwhelming evidence of harm, which could take the form of physical harm (e.g. cocaine-induced seizures, heart pains) or a disintegration of the person’s social relationships and daily lives. Whilst many crack users and freebasers did things they were ashamed of, they did not resort to the street crime, violence and prostitution that media reports link to this form of cocaine use. Those who did commit crimes did ones they knew how to do (e.g. lawyer who embezzled, insurance clerk who filed a false insurance claim), rather than resort to an activity (e.g., burglary) for which they had no experience. On the other hand, the drug can produce a different sort of crime in people who have little other means of supporting themselves, few normative bonds to conventional society, and little to lose by throwing off the remaining restraints. This is another clear indication that the effects of drugs are not just determined by the drug, but by the social context as well. The fact that more pronounced behavioural disruption is caused by freebasing and crack than cocaine powder is another clear example that not all can be explained by the simple effects of a drug in the brain. Finally, this research revealed that whilst freebasers and crack users seemed powerless to stop using during a session, most would often go days and even weeks at a time without using in this way. Therefore, the obsession with cocaine appeared to be episodic rather than chronic; whilst showing a compulsive pattern during a session, users did not remold their lives into one session. Many of the crack and freebase users began to recognise an accumulation of negative consequences (defined as “trouble”) and/or a downward spiral in their lives caused by their obsession with freebase or crack. This led to some interviewees to cut down on their freebasing and others to quit entirely. Waldorf and colleagues do not go into details about the quitting process amongst this population, but do report that over 40% had stopped using cocaine. Cocaine changes: the experience of using and quitting by Dan Waldorf, Craig Reinarman and Sheigla Murphy. Temple University Press, USA. The taming of cocaine: Cocaine use in European and American cities by Tom Decorte. VUB University Press, Belgium. There is in fact a difference between freebase cocaine and crack cocaine that will not be discussed here. In their study, Waldorf and colleagues treated freebasers and crack users as a single group, as I do here.